1.25.6 Your election in respect of marketing communications. 1.35 "You" or "your" refers to a person who has made a request for access to the Service on these Terms and Conditions. 3.4 Authorise us to do anything that is unlawful in terms of Applicable Laws or fail to do anything that is required in terms of Applicable Laws, to the extent that it is impermissible to do so. 4. The Agreement is deemed to be concluded at our principal place of business in Randburg, South Africa, and commences on the date on which we accept your Request by activating your access to the Service. 6.2 Those rights and obligations which, in terms of the Agreement, either expressly or by implication, will survive beyond termination. 7.1.2 The last day of the next Billing Period if the termination notice is not received by the other party at least five business days prior to the last day of the Billing Period in which the termination notice is received. 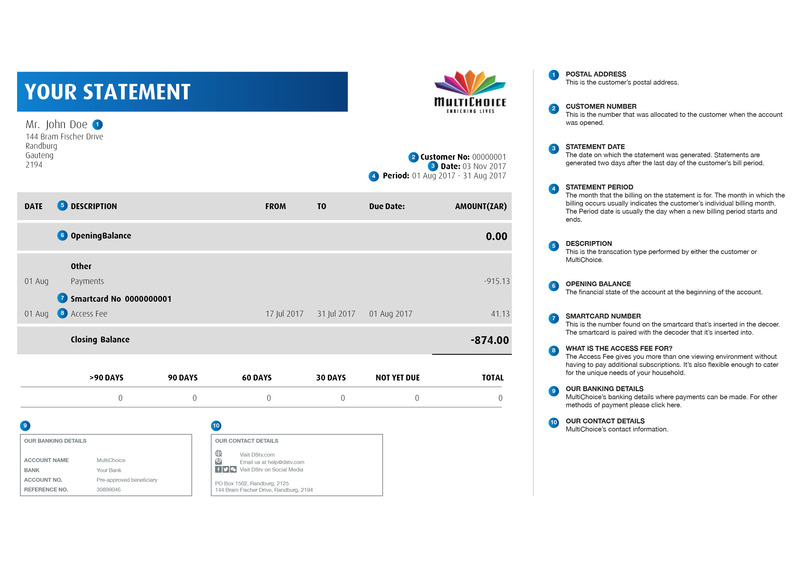 7.2 If, at the time that the termination takes effect, you have already made payment of your Fees in respect of any subsequent Billing Period/s, then we will, within 30 business days after the termination takes effect, refund to you your Fees in respect of such subsequent Billing Period/s. 8. We will provide the Service to you on a pre-paid basis. 9. In order to have continued access to the Service you must make, and we must receive, payment of your Fees in advance on or before the Monthly Due Date. 10. If we do not receive payment of your Fees as contemplated in clause 9 above, we may suspend your access to the Service. 11. If your access to the Service is suspended, we will not reactivate your access to the Service until we have received payment of your Fees and the Reactivation Fee. 12. We may from time to time amend the fees payable in respect of access to the Service. We will notify you of such an amendment as soon as practicable prior to implementing it, so that if you wish to terminate the Agreement you may do so. We may alter the Payment Instruction to correspond with any change in your Fees. 13. We may use payment systems owned and operated by third parties ("Payment System Providers") to facilitate the collection of fees and other amounts payable by you in respect of the Service. None of these Payment System Providers is our employee, subcontractor, agent, intermediary or representative, or otherwise controlled by us. 14.2.2 By post, if you have not provided us with the relevant electronic contact details. 15.2 Inform us in writing within seven business days of any change to any of the information provided by you in relation to the Agreement. 16.5 Retain your personal information referred to in this clause for as long as we are required to do so in terms of Applicable Laws or in order to exercise or protect any of our rights under the Agreement. 17. It is your responsibility to ensure that the information which you provide to us is complete, accurate and up to date. 18. In consideration for your payment of your Fees, and subject to you complying with the Agreement, we will provide you with access to the Service in accordance with the Agreement. 19. Subject to your compliance with the Agreement, we will continue to provide you with access to the Service until your access is suspended or the Agreement is terminated in terms of these Terms and Conditions. 20.4 To ensure the integrity or error-free playback of the material copied to the HDD. 21.3 At your Physical Address. 22.8 Permit, facilitate or condone any other person conducting any of the prohibited activities in this clause, whether using your Equipment or otherwise. 23. If you wish to receive and/or use the Service at an address other than the address referred to in clause 21.3, you must notify us of such address. 24. If you sell or otherwise transfer the Equipment, then you must advise us in writing, within seven business days thereafter, of the identity and contact details of the transferee. 25. You agree that we may, from time to time, and on reasonable notice, delay or interrupt the distribution or reception of the Service, or any aspect thereof, if this is reasonably necessary for any purpose related to our business, including in order to support the provision, operation, maintenance and security of the Service, or any aspect thereof. 26. You acknowledge that certain aspects of the Service may only be available in conjunction with certain Equipment. 27. You must use an Approved Decoder to access the Service. 28.4 To keep your decoder connected, at least in standby mode when not in use, to the main power supply and to the reception equipment, to enable the functionality of the software, updating of the software in the decoder and in order to ensure that your continued access to the Service is not negatively affected. You acknowledge that in standby mode certain Approved Decoders generate heat and that you will position your decoder with this factor in mind. 29.2 We or one of our duly authorised representatives will replace the Smartcard, subject to the payment by you of a standard replacement fee. 30.5 It is otherwise reasonable to do so. 31. You may access material recorded on the HDD only while you have access to the Service. 32. No material on the HDD may be copied, modified, sold or transferred to any person. 33.2.2 Refund to you the price paid by you for the equipment. 34. The implied warranty of quality and your right to return the Equipment under the Consumer Protection Act referred to in clause 33.2 are in addition to the Manufacturer's warranty referred to in clause 33.1 and any other implied warranty or condition available under any Applicable Laws. 35.3 That the software used to provide the Service, including our system software and software applications, is error-free, flawless or without fault. 36.2 For any malfunction of the Equipment if such malfunction does not amount to a defect, failure, hazard or unsafe characteristic as contemplated in the Consumer Protection Act. 37.2 You will not infringe our rights or interests, or those of our suppliers or licensors, in the Content Rights and the System Rights, in the course of your access to and use of the Service. Nor may you negligently or intentionally permit any other person to do so. 38. You acknowledge that the provision of the Service may include and/or rely on a technological security framework ("security framework") designed to protect the Service against unauthorised use, which security framework will be automatically implemented, maintained and modified from time to time. 39. You agree to such implementation, maintenance and modification of the security framework, which may include the disconnection or discontinuation of any features of the Equipment which facilitate unauthorised use of the Service. 40. Our failure to implement the whole or part of the security framework will not constitute a waiver of any of our rights resulting from the unauthorised use of the Service. 41. You may authorise any person to communicate with us on your behalf in relation to the Agreement, provided that such person complies with our standard security check. You agree to be bound by all requests and undertakings made by third parties on your behalf in terms of this clause. 42. It is your responsibility not to disclose the personal information relevant to our standard security check to third parties whom you have not authorised to represent you. 43. Subject to any Applicable Laws, we may communicate with you, amongst other methods, by means of e-mail, on-air communications, or by way of text or other messages to your cellular phone, computer, laptop, mobile device or to your decoder for display on your television screen. 44.6 Notify you of a General Amendment. 45. You may refuse to accept, require us to discontinue, or pre-emptively block in accordance with clause 48 below, any approach or communication from us if that approach or communication is primarily for the purpose of direct marketing ("Direct Marketing Communications"). 46.2 At any time by requesting us (in any manner, whether telephonically, electronically, in writing or in person) to desist from sending any Direct Marketing Communications to you. 47.2 Not send you any further Direct Marketing Communications. 48. You may, in terms of the Consumer Protection Act, register a pre-emptive block against Direct Marketing Communications. If you do so, we will not send you Direct Marketing Communications unless you have expressly consented to receiving Direct Marketing Communications from us. 49. We will not send you Direct Marketing Communications at home at any period during which it is prohibited by law to do so, unless you have expressly or implicitly requested or agreed otherwise. 50. The nature, composition and content of the Service are determined by us and may be changed by us from time to time, subject to any Applicable Laws, and subject to your right to terminate the Agreement in accordance with these Terms and Conditions. 51. The various systems necessary for or associated with the provision of the Service (including technical services, signal distribution and satellite capacity, the conditional access system, the software operating system, software applications, customer management services and business systems) are determined by us and are subject to ongoing innovation and change and may be amended by us from time to time, subject to any Applicable Laws and subject to your right to terminate the Agreement in accordance with these Terms and Conditions. 52. Subject to the terms of the Agreement and any Applicable Laws, you agree to be bound by a General Amendment from the date specified in the General Amendment notice, which will be a date a reasonable time after the date of the General Amendment notice. 53.2 In the event of the breach of a material provision of the Agreement in circumstances where the remedy of specific performance or damages would not adequately prevent the Aggrieved Party from being prejudiced, to cancel the Agreement, in which case the Aggrieved Party must give the Defaulting Party notice in writing of the cancellation, and the cancellation will take effect on the giving of the notice. 54.2 Those rights and obligations which in terms of the Agreement, either expressly or by implication, will survive beyond cancellation. 55. The breach provisions in these Terms and Conditions are without prejudice to any other remedies to which a party may be entitled at law, including the right to claim damages. 56. In addition to our rights under clause 53, if you materially breach the Agreement we may, without prejudice to any other remedy that we may have, immediately and without notice to you, suspend your access to the Service. 57.3 Make payment to us of your Fees and the Reconnection Fee, then we may reactivate your access to the Service. 58.2 Supersede any previous agreement between you and us, or between you and any other company, in terms of which you were authorised to have access to the Service. 59. Neither you nor we are bound by any express or implied representation, warranty (except any warranty implied by law), undertaking, promise or the like not recorded in the Agreement. 60. Any relaxation or indulgence which we may show you at any time in regard to the Agreement is without prejudice to, and does not constitute a waiver of, any rights we may have, either in terms of the Agreement or any Applicable Laws. 61.2 The remaining provisions of the Agreement will remain of full force and effect. 62. We may cede our rights in terms of the Agreement to any person without your consent. 63. You may not cede any of your rights or transfer/assign any of your obligations under the Agreement to any person without our prior written consent. 64. The Agreement is subject to, and will be interpreted, implemented and enforced in terms of the laws of South Africa. 65. The parties consent to the jurisdiction of the Magistrates' Court in respect of all proceedings arising out of or pursuant to the Agreement. This notwithstanding, either party may institute any proceedings arising out of or pursuant to the Agreement in any Division of the High Court of South Africa having jurisdiction or any other forum having jurisdiction. 66.1 Us: 251 Oak Avenue, Randburg, 2125, Gauteng, South Africa. 66.2 You: Your Physical Address. 67. Either party may at any time by written notice to the other party vary its domicile address in terms of clause 66 to any address within the Republic of South Africa. 68. A notice actually received by a party will be adequate notice to that party notwithstanding that it was not delivered to that party's domicile address in terms of clause 66.